What kind of foamer is right for your brand? Whether it's premium, OTC, travel-sized or eco-friendly, Quadpack now offers foamers as complete packs, ready to be personalised to your requirements. With a choice of HDPE and PET bottles in different capacities, the entire range is endowed with Apollo's patented foam technology. Apollo foam pumps produce rich foam with a luxurious, even texture. They are engineered to keep metal parts out of the product path to protect formula integrity - a real concern for OTC formulas. Quadpack has now developed standard bottles that perfectly fit these superior pumps. This drastically cuts overall development time, while the whole pack retains the flexibility to be adapted to your marketing brief. PET offers greater transparency and a glossy texture, while HDPE has an attractive matt finish. All bottles can be decorated using a variety of techniques such as colour matching and screen printing. Foam pump options include standard, premium and mini/travel varieties. Quadpack has developed a high-tech gesture for lipsticks with the new Magnetic Stylo; a stylish lipstick case that closes magnetically with the snip of a click! Its elongated shape is designed for slanted tip lipsticks, a design cue that denotes a premium product. It is crafted in shiny metal, a material that communicates luxury, is cool to touch, and can be decorated with a wide range of techniques, from anodizing, to embossing and silkscreen printing. It seems like the dark ages when we only talked about ‘creams and colognes’. These days, technology, innovation and a host of cultural and social factors have pushed the textures of beauty and cosmetic products beyond our imagination. Capsules, balms, jellies, scrubs – beauty these days is not just high-tech, it’s also fun and consistently surprising. Quadpack’s latest panstick is gloriously wrapped in metal. Part of the Q-Line range, the Slim Metal Panstick adds elegance and lustre to any beauty product, making it perfect for luxury and masstige brands. The beauty world is becoming more inclusive than ever, with fragrance, make-up and skincare products tailored for a more diverse audience. The latest trend of customising face creams with boosters and other active ingredients means you can tailor your product to your own, individual needs. These high-tech formula depend on precision dosage. Now, Quadpack proposes an innovative way to dispense these technical formulas, while giving consumers greater control: the Yonwoo Ampoule Dropper. The curse is broken! The days of leaking creams and shattered powder in your handbag are over, thanks to today’s new solid formulas. They save us from spillage and perform just as well as liquid or powder products. With on-the-go beauty and personal care high on the list of consumers’ priorities, it's no wonder that these practical, easily-transportable products continue to gain traction. Quadpack's latest stick from Yonwoo is the perfect travel-sized container for the new generation of skincare, make-up and fragrance balms. Post-consumer recycled (PCR) plastic makes a lot of sense. It uses raw materials made of plastic waste, reducing landfill and pollution of our streets and oceans. It uses less energy to produce, even considering collection, recycling and remanufacture. And when it takes the shape of a Quadpack tube, its performance is second to none. Airless packaging with a 'pop'! Discover Quadpack’s latest packaging solution from Yonwoo that adds a sensory level to your skincare routine: Capsule Airless. Quadpack’s Skincare Division has taken three of its most popular acrylic jars and matched them with gorgeous wooden caps – designed, produced and decorated entirely at Quadpack’s Manufacturing Division in Spain. The result? A versatile range of 50ml jars, quickly adaptable to any brand requirements. Buying a fragrance is a personal thing; one you experience on multiple levels. The packaging plays a vital part of that experience. Beyond the aesthetic, it can touch all the senses, just like the fragrance inside. With a view to providing an enhanced sensory experience, Quadpack’s Fragrance Division presents The Elemental Collection. Feeling tired? Does it show? Yonwoo’s Ice Tube from Quadpack helps soothe puffy, swollen skin, thanks to its ice-cold applicator. The perfect package for gel-based formulas, it turns a skincare routine into a calming ritual or a much-needed moment of me-time. What’s more, it can be used to relieve muscle pain all over the body, for OTC brands targeting athletes or a wider audience. The YouWood range recently launched by Quadpack's Make-Up Division has a small but powerful new member: an airtight glass pot. Designed for 24-hour products such as gel eyeliner, lip colour or creamy eye shadow, this attractive 4ml jar boasts some special features. Is it a dropper? Is it a tottle? It's both! Quadpack presents Yonwoo’s Drottle, its latest innovation for a new generation. Different and fun, it offers a new twist on a traditional system. Clay has been used for beauty treatments throughout the ages and, now, clay face masks are making a comeback. They remove impurities and absorb oil, while their mineral content deeply nourish the skin. These masks leave your skin beautifully clear and soft, but applying them can be a messy business. Now, Quadpack’s secondary packaging team presents the ideal solution in the shape of a dual-sided applicator. Gently rub your skin with Quadpack’s new Tourmaline Konjac sponge and you may just get the same sense of wellbeing as if you were standing by a waterfall. That’s because the tourmaline ingredient is loaded with negative ions. These magical molecules effectively disarm airborne pollutants and allergens. The best way to match your lip colour to your blusher? Use the same product! New from Quadpack is Yonwoo's Two Way Applicator. Created for formulations that are suitable for both lips and cheeks, it offers – as the name suggests – two ways to apply the product. Soft and creamy formulas are wonderful for luscious lips. Their texture can pose a challenge for the packaging, however. As the bullet is screwed up and down, there is a risk that it gets bent out of shape or, worse, that it breaks off. Yonwoo has engineered a lipstick with a ground-breaking mechanism that neatly circumvents the problem: ST Lipstick, now available from Quadpack. Fragrance formats are evolving. Recent launches on the market are shaking things up and generally making perfume sexier and more fun than ever before. Chanel, Kenzo, Derek Lam, Victoria's Secret, Byredo… a host of brands are starting to launch new scents onto the market which eschew the traditional liquid format. Applying lip colour becomes a sensory experience with Yonwoo’s new Cushion Lipstick. Dab, brush or blend the formula onto the lips or cheeks with its soft-touch sponge, for a feeling of pure indulgence. Is any packaging material more precious than wood? Its texture, its smell, its finish all touch the senses in a way that reaches you on an emotional level. And when it’s responsibly sourced, it sends a powerful message about sustainability. Now, make-up brands who have such a story to tell can choose from a beautiful new collection of wooden packaging from Quadpack’s Make-Up Division: YouWood. Proud, strong and classic, yet open to a touch of contrast. Charismo is the newest launch by Quadpack’s Fragrance Division. Its strong lines can be complemented by a cap that follows its silhouette for a pleasing, coherent aesthetic. But combine it with a vastly different cap shape and material, and the juxtaposition is surprisingly effective. Quadpack’s Skincare Division is extending its range of luxury jars with Arno, a high-end acrylic jar that’s perfect for premium brands. Designed in-house and manufactured at the Quadpack Plastics injection-moulding facility, Arno is a shining star in the Q-Line range. When it comes to deodorant roll-ons, bigger really is better. A large, well-manufactured roller ball glides the product on the skin in a comfortable gesture. Quadpack’s new Big Ball Deo Roll On has a perfectly-welded ball held in a bottle with an integrated ball support. What makes it stand out is the sheer scope for decoration: Big Ball Deo comes with snap-on colour changing discs, the option of coloured balls and a host of bottle and cap shapes to play with. The new Gemel Purse Spray is Quadpack's latest addition to its Q-Line family of products. Conceived by its in-house design team together with Quadpack's Fragrance Division, Gemel is a beautiful little pack with a unique look and feel that hooks into today's trends in aesthetics and usage. Soft, long-wearing lipsticks are the busy woman's best friend. On the go all day and perhaps all night, these little helpers ensure the perfect pout, with colour that won't kiss off. Such hard-working formulas need hard-working packs. Now, Quadpack's Make-Up Division puts a high-tech proposal within the scope of mass market brands. Suitable for any lipstick and lipbalm formulation, its new Q-Line Airtight Lipstick has added features which help keep soft, long-lasting formulas fresh and ready. The no-water trend is growing and with it, a fast-expanding range of dry formulas. Beyond their water-saving properties, powders have the capacity to delight, as the formula is ejected in a magical cloud. Baby powder, shimmering body powder, SPF powder, face powder, fragrance dusting powder; these are just some of the products available on the market today, with many more to follow. Invest in the formula, save on the packaging. Mass market and masstige brands now have a tube for local application that offers unparalleled price/performance. Launched by Quadpack's Skincare Division, Appli Tube from Yonwoo is a cost-effective solution that combines ease of use, a pleasant application method, a high value perception and surprisingly powerful formula protection – all delivered in an unassuming yet appealing little pack that hooks right into the small format trend. Meet Guadiana, Quadpack's most luxurious jar. 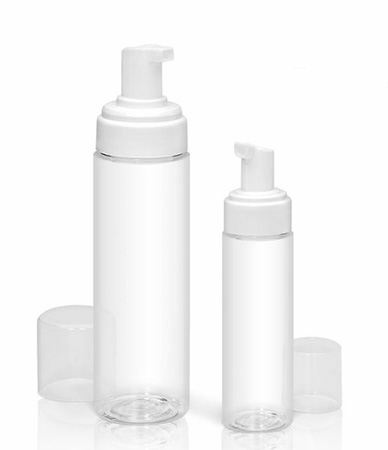 Its combination of attractive shape with calibrated weight translates into the ultimate acrylic jar for luxury brands. The latest member of the Q-Line family, Guadiana is designed in-house and manufactured at the Quadpack Plastics injection moulding plant in Spain. As such, it is 100% customisable, with a choice of materials, seals and decorating options that can transform it into a unique packaging proposition for the most prestigious skincare products. Apply, perfect, carry on. Make-up application is becoming more professional by demand, but not at the cost of convenience. Consumers want expert tools that save time and make their life easier. The Dual Slim Jumbo is designed to offer exactly that: a practical jumbo stick that helps you make up your face like an artist. Today's busy women don’t want to waste time having to touch up their make-up too often. That's why brands are offering 24h formulas that stay fresh all day. To support this trend, Quadpack's Make-Up Division has made a new introduction into its catalogue: the Airtight Glass Pot.